Diamond Head Hillside is a six-story building constructed in 1967 with an elevator. Diamond Head Hillside has 32 residences in two-bedroom floorplans. Interior sizes are between 615 to 630 square feet. Most if not all units have lanai areas with between 50 and 160 square feet of area. 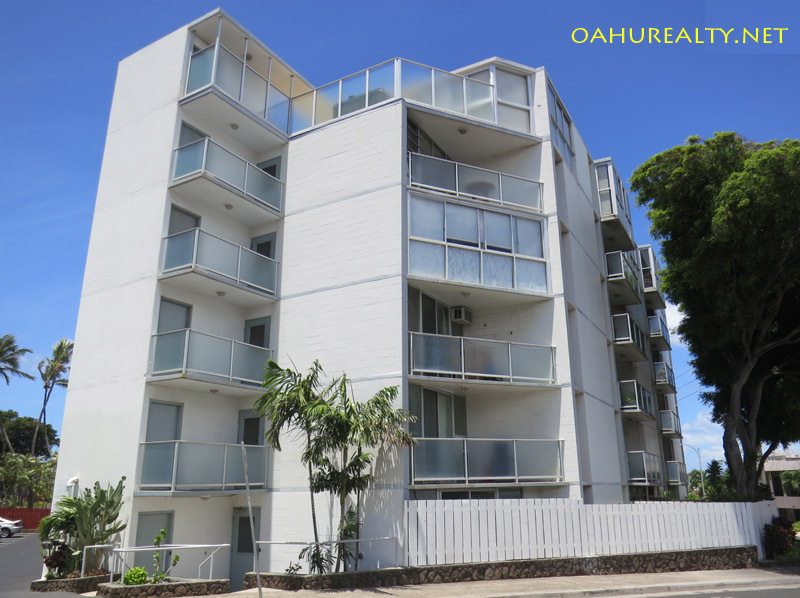 In the photo above, note the ground floor units behind the fence are those with the larger lanais. Diamond Head Hillside was originally sold in leasehold. Most, if not all of the units, have been converted to fee simple. The building has allowed pets in the past, if you have a dog or cat please check with management to ensure compatibility. Hawaiiana is the management company for Diamond Head Gardens. Phone: (808) 593-9100. Diamond Head Hillside also has a resident manager at the building.